There’s one big problem with plumbing: the majority of the time, it’s hidden, and unless you have easily-removable floating ceiling tiles in your basement, it can be really hard to get a clear look at how and what your pipes are doing. And that can lead to some serious complications. Is this section of pipe wet because of perspiration or do you have a slow leak? And if it is a leak, where is it coming from? Your plumbing runs all through your walls and ceiling, and that means the water can be traveling a significant distance along those pipes before you even start to notice a problem. That’s bad news in itself. 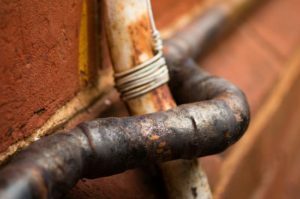 Not only do you have to identify that there is a problem, but you also have to locate the right section of pipe to repair the leak, and that might lead you to a lot more unexpected damage. Plus, you have to identify the cause of the problem. Was this a localized incident, or is this just the beginning of a problem that is going to require you to replace a lot more of your plumbing before it, too, begins to leak, potentially causing new damage to the section of wall or ceiling you just replaced? What can go wrong if you don’t notice the problem right away? Lots. Namely larger and more extensive damages to your home. You may go from having to replace a section of pipe that is leaking and repaint a water stain on the ceiling to having to replace a section of pipe and all of the drywall on the walls and ceiling of that room—and the one underneath it, along with your flooring, furniture, electronics—and the wiring of your home. Of course, that’s if the problem manifests somewhere apparent. What if there is a slow leak causing damage to your unused storage space in your basement? Left unnoticed and untreated, it could lead to something as nasty as black mold, which could lead to significant health and respiratory problems for you and your kids. Can water damage, if left unseen long enough, cause foundation problems in your home? And of course, there is the contamination that could occur as a result of a backed-up sewage system of septic tank—and if there is a problem there, how close does it need to come to your well or water intake for there to be a potential problem? In other words, your plumbing can cause some significant problems for your home and your health, but how do you know when you should be contacting a leak detection professional? If you haven’t done so already, it might actually be too late. You don’t want to wait until there is a problem to start looking for a leak detection professional; you should be contacting your local plumbers now. Before there is even the potential for there to be a problem, you want to know the number of the leak detection professional who can help you out. This will allow you to do your research to make sure you have found the right plumber for you: one who is close to home, available 24 hours a day, affordable, and one who has access to the most current and up-to-date leak detection technology. Once you’ve found your leak detection and plumbing service professional and saved their number to your emergency contact list, you aren’t quite ready. You still need to contact them and get them to your home for an electronic leak inspection. Sure, it may not seem like there is a problem, but a lot of plumbing problems can go unnoticed for a long time until they are big enough that they can’t be overlooked any longer—and those problems don’t usually turn out to be the cheap ones to fix. A leak detection professional can use electronic leak detection to identify if there is a problem and where it is in your home before it causes a big mess—and that can cause you thousands of dollars in repair expenses. Plus, they can identify the cause of the problem, which means that, if you have a large amount of plumbing that is getting old and ready to start springing a leak, they can pre-emptively repair it before it starts racking up the repair dollars. You never wait for your car to break down before you take it in for a service and inspection, so why wait until your most valuable asset runs into a significant and potentially hazardous problem? Contact a leak detection professional today and get a lid on those drips before they get out of hand.